In the plaza next to Donovan's Irish Pub. Dunkin' Donuts is the world's largest coffee and baked goods chain, serving more than 3 million customers per day. 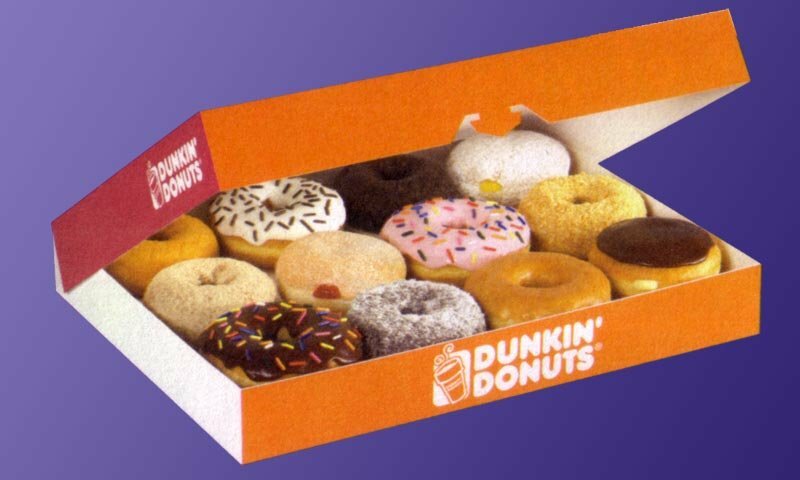 Dunkin' Donuts sells 52 varieties of donuts and more than a dozen coffee beverages as well as an array of bagels, breakfast sandwiches and other baked goods. Dunkin' Donuts is located at Palencia in the plaza next to Donovan's. The Palencia location is BEYOND awful. The employees have no pride in their company or their job. They do not appreciate the customer and there are very few of them who are nice. The fact that they have been CLOSED at 635am multiple times when I’ve gone, is amazing. How are you still in business?! I’ve been told more than once that the bakery “forgot” to make the delivery and they have a limited menu for the day. They are S-L-O-W and not apologetic about it. I’ve sat waiting for a bagel for 10 minutes!!!!!! I guess it’s my fault that I keep going back, but I like to see the best in people and hope that it’s just an off day. They’re off all the time. This location really needs anew manager and someone who truly has pride in the company. I don't know how the Dunkin Donuts franchise works but somebody really needs to buy this manager out before they bring down the Dunkin name any further. Management really needs to get a grip. Stocking an inventory is not rocket science. Scheduling 5 teens on one day and two adults on another doesn't work either. Just so you know. And could somebody please explain that when your working a register and preparing food, using the same pair of gloves is not healthy. And close the ice bin. 15 minutes to get my order (one sandwich, one donut, no drink) and I was second in line. Can I rate it 0 stars?? This location is absolutely horrendous. I'm actually writing this review in the location and I see why all the other reviews are just as bad. First off, as I entered, I saw employees standing around, talking, looking at cell phones, etc. I place my order which the cashier apparently didn't know how to enter into the register and got help from another employee. No biggie. My coffee came out and was fine and I waited for my steak egg and cheese croissant to come out. I went to get a seat and noticed the napkin dispenser was empty. It confused me because they were all standing around moments earlier talking to their friends and giving their ftiends free refills on their iced beverages. So I approached the counter a couple minutes after getting a seat and the employees are all standing around at this point and the guy who is supposed to be in charge of sandwiches asked me what I ordered. After I told him, he finally got started on it. Very p*** poor customer service. Owners of this place are clearly some of the worst decision makers around. I visit this particular DD at least 3 days a week on my way to work. This morning, at 6:20 am I pulled into the drive-thru. After sitting there 6 minutes, no one had taken my order or acknowledged I was even there. I blew my horn - nothing! I pull up to the window. Two young workers are standing at the counter doing nothing! I blew my horn again - nothing! Finally after 2 or 3 minutes, one of the employees sees me and SLOWLY walks over and opens the window. I said, "I think your drive-thru is not working." He said, "No....We just forgot to put on our headset." Yesterday, when I drove up to the drive-thru, as usual, I was asked to wait. Fine. When she finally came back to me, she could not get my damn order right. I only wanted an XL coffee with cream. Had to tell her 4 times...XL coffee with cream! She sounded & acted completely confused, as if strungout on drugs. Last Saturday, I ordered an XL coffee and a pepper jack bagel. They got it right, it was good! The very next day, I ordered the same thing again. The response? ..."We do not serve the pepper jack bagels anymore." ...Really? It was still on your damn menu! Another experience a few weeks ago, at 6:30am, I ordered an XL coffee and a dozen glazed donuts. Their response? ..."Sorry sir, we do not have any donuts." Are you effin kidding me??? A Dunkin Donuts with NO donuts! This is only a few of my bad experiences over the last few months. I have never had such consistently bad service from a business, ever! They rarely get the order correct, the employees seem dazed, slow, and uninterested. The owner of this franchise is obviously not a hand-on owner, the managers are failures....Your employees reflect that fact perfectly! Why is this place so consistently horrible? This location is AWFUL! It is such a shame, because it will eventually shut down and I really like Dunkin Donuts. Every time I go there they never have any donuts. They are always out of the right size cup. Today, they were out of CREAM. CREAM! I have witnessed the manager inappropriately disciplining her employees in front of me, telling them to punch out and go home, when they were the only ones working. I needed to ASK her, the manager, for my coffee I ordered and paid for before she left the store, went out to her car and was on her phone. Clearly the only functioning employees quit and now there is no one left with any abilities to work in a coffee shop. Another employee was discussing that they wouldn't allow a person in there anymore if they were just going to order a cup of water. And "*****" has already told him he can't come in there anymore. How friendly! Is there really anything else you can order at this location besides water? It's always an unpleasant experience and will have to go to Starbucks from now on. I have frequented Dunkin Donuts for the past 30 years and if there were to be an award for the worst one I have ever seen, this place would win hands down. The manager must be a No Show Empty Suit. It is obvious because the place is understaffed, the service is horrible and they are lacking many basic items like donuts of all things. I long for a NY style place loaded with workers/manager from Bangladesh who have everything you want, whenever you want and move like greased lightning. I have tried this dump for 6 months now and no improvement. They are always out of everything from donuts to coffee. They turn customers and revenue away left and right. I'd love to help turn this Dunkin Donuts around and keep it in business. Who is the owner and who manages it? After repeating twice my order, I paid up front w/ my debit card, recieved No receipt, waited almost 15 minutes, they had no customers in the drive thru, I was the only one for just 2 small items? Then after coming in late for work due to waiting, was not even what I ordered. Was terrible. Was told to move up pass the sidewalk, when there were no other cars behind me, this guy comes out with my order and looks like he knows it's wrong with a half grin looks at me almost sarcastically, I drive off, and feel honestly I will never go back to this ridiculous establishment, will blast it on my fb. Mistakes happen I can deal with that, but I feel foolish for ever going to dunkiin, will never go back!!! This DD is the worst one I have ever been to. They are out of everything all the time. I mean even cups. Donuts are always wet and they can never get an order correct. Usually on my fourth thing to order they might have that. I would go somewhere else but there is nothing near by. I think I might open a Krispy Kreme next door! I JUST WANT A BAGEL! I SWEAR EVERY TIME I GO HERE THEY ONLY HAVE CINNAMON RAISIN BAGELS. NO ONE WANTS THAT! GET IT TOGETHER!!!!! In the morning, all I want is my coffee and my breakfast. And I want it the way I order it. Unfortunately, that never happens here. I pull away from the drive thru to find my sandwhich isn't made properly and is missing ingredients and then my bag doesn't contain a straw to drink my iced coffee. They try offering me a free donut to fix the situation, but then only have 3 different kinds of donuts available, none appealing enough, that even my kid denied the offer! The staff is always attentive to my needs and adjust to any situation thrown at them. I live in the area and have been to this store many times. Why? I don't know! Every time I go they never have the first thing I order, sometimes not even the second. Either their frozen coffee machine is 'down' or they only have 3 different kinds of donuts. The store is run by a bunch of teenagers who don't care. I've heard them fight about who is going to make my food and I've watched them eat right at the drive thru window for all to see. It's disgusting. Today I ordered two bacon, egg, and cheese on everything bagels...there was no cheese , the eggs were just egg whites, the bacon was burnt, and my bagel was literally in pieces. Just like they put it back together like a puzzle. Who does that? And then serves it to someone? Needless to say, I will NEVER go back there!